Side loading these trailers are not only easy, it also gives you a narrower load to see around while towing. The two place side loading ATV88 is a nice trailer that will provide you with drive-on and drive–off capability! 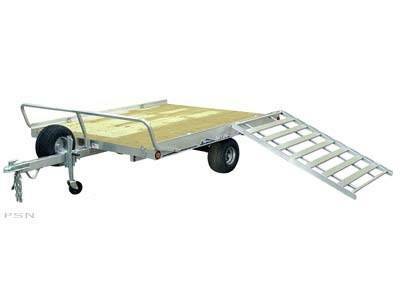 The ramp stores in the rear of the trailer under the deck and slides out to use on any side or in the rear for loading/unloading your ATV’s and other equipment! All ATV Series trailers have the Ramp Clamp system which secures &: locks up the ramp while in storage under the deck.